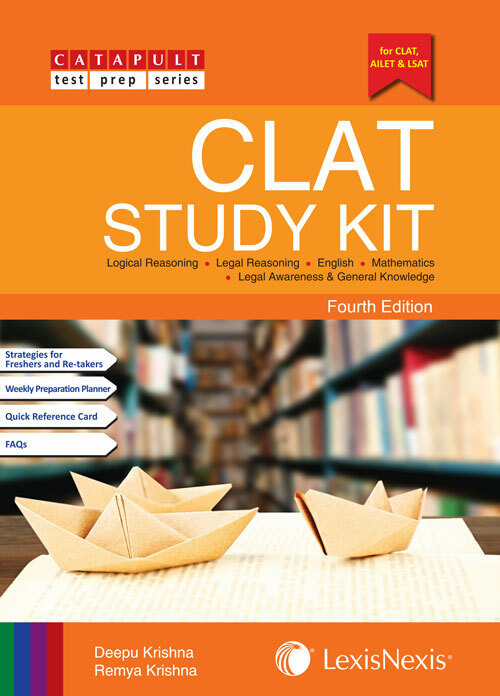 “The CLAT Study Kit is a comprehensive book designed to prepare students for the CLAT Examination. It has been designed to help the user understand the concepts of Legal Reasoning, English, Logical Reasoning, Mathematics and General Studies. Legal Reasoning, is known to be the most difficult yet interesting subject of CLAT/AILET where the aim of the examiner is not to judge a student’s knowledge of law but to test a student’s awareness about legal concepts. English, said to be the lingua franca of the world, has been a major scorer in CLAT. The Study Kit will aid the students in understanding the essentials of English in CLAT and help them to prepare in a better and tailor-made manner. Logical Reasoning, the growing tilt towards the Critical Reasoning section is evident when we analyse the past years’ CLAT question papers. The Study Kit includes a wide variety of logical reasoning questions such as syllogisms, logical sequences, analogies, etc. The Study Kit covers all the topics of Deductive, Analytical and Critical Reasoning required in your preparation for CLAT. Mathematics, that test you on your knowledge of Elementary Mathematics (Class X level). Understanding the fundamentals of the topics of the Study Kit and doing all the exercises given in the Study Kit would make the mathematics section in CLAT a cakewalk for the user. Legal Awareness & General Knowledge, Current Affairs & General Knowledge carries a weightage of 25%. The Study Kit covers all the must-study topics of GK. For current affairs, reading renowned dailies like the Hindu, competitive magazines and watching the news on a regular basis will additionally help.